Observers of Chinese religion have long been enchanted by the endurance of Chinese imperial symbolism, even though imperial China was usurped by Japanese modernity and then by republican democracy on Taiwan, as well as by a communist regime on the Mainland (Ahern, 1973, Feuchtwang 1992). More recent studies bring contemporary states into the temple. Chi Chang-hui (2009) explores “heteroglossia” on Jinmen, as the Nationalist state tries to encourage worship of drowned virgin as a deity, but local people treat her as a ghost. Tsai Yi-jia (2004) examines a Medium’s Association in the context of Cross-straits rapprochement, as socially marginalized mediums organize within the framework of modern professionalism. Stephan Feuchtwang (2003) studies temples and festivals as civic institutions with democratic elements. Institutions are the key to understanding these situations. On Jinmen, the Ministry of Defence established a temple to Wang Yulan in an attempt to augment official nationalism, but built it outside the territorial limits of established religious institutions, thus reinforcing local perceptions of her as a ghost (Chi 2009). On Taiwan, mediums felt compelled to establish a professional association and refer to Chinese political icons to justify their activities (Tsai 2004). And on both sides of the Straits, religious actors assert local sovereignty through religious institutions, even as they are treated as mere representatives of “local culture” by intellectuals and politicians. These approaches make it clear that religious institutions are not repositories of tradition, but arenas for the actions of embodied individuals. As Wolf said, whether a spirit is a ghost, ancestor or god depends on the point of view of the worshipper (Wolf 1974: 146). If we study religious institutions as part of lived environments, they can be well understood through a dwelling perspective that “treats the immersion of the organism-person in an environment or lifeworld as an inescapable condition of existence” (Ingold 2000: 153). Difference in cognitive experience explains why ROC state officials can hope to install Wang Yulan as a goddess, whereas villagers perceive her as a ghost. For officials who arrive on Jinmen by plane or boat, Wang Yulan appears to be on the inside of Jinmen. For villagers who cross the habitual limits of temple processions to visit her shrine, she is clearly on the outside and thus a ghost. The mediums, by channeling Sun Yat-sen, Chiang Kai-shek, and Mao Zedong, assert a meaningful place in their contemporary political environment. They strongly favour a Taiwanese perspective when they treat deceased Mainlander veterans as hungry ghosts (Tsai 2004: 68), marking Mainlanders as eternal outsiders. Temples create zones of autonomous space, their sovereignty reinforced when politicians and other outsiders must politely request permission to enter. These studies demonstrate that religion is not the embodiment of abstract culture, but rather the ongoing action of conscious beings in space and time. If anthropology is to become an ethology of the human species rather than a study of superorganic cultures based on assumptions of a nature-culture divide, a combination of an institutional approach with a dwelling approach is extremely useful. 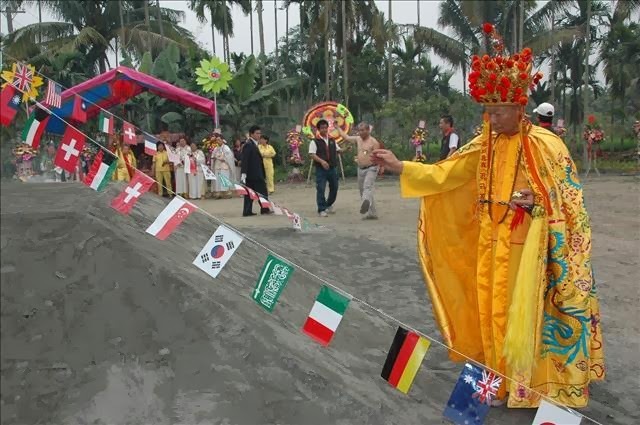 See Youtube for some great videos by Fabian Graham on Taiwanese popular religion. Ahern, Emily. 1973. The Cult of the Dead in a Chinese Village. Stanford: Stanford University Press. Chi, Chang-hui. 2009. “The Death of a Virgin: the Cult of Wang Yulan and Nationalism in Jinmen, Taiwan.” Anthropological Quarterly 82 (3): 669-690. Feuchtwang, Stephan. 1992. The Imperial Metaphor. London: Routledge. ______. 2003. “Peasants, Democracy and Anthropology: Questions of Local Loyalty.” Critique of Anthropology 23 (1): 93-120. Tsai, Yi-jia. 2004. “The Writing of History: The Religious Practices of the Medium’s Association in Taiwan.” Taiwan Journal of Anthropology 2 (2): 43-80. Available on line at: http://www.ioe.sinica.edu.tw/Content/Periodicals/content.aspx?&SiteID=530164240637641451&MenuID=530167100636226027&SSize=10&Fid=0&MSID=530205535200537247, last accessed November 5, 2013.